About: I recently embarked on a Sri Lankan journey that whetted my appetite for the taste and flavours of this country – right here in the heart of London. The Shangri-La Hotel at the Shard brought to the capital celebrity Chef Dharshan Munidasa who runs the fine dining restaurant Kaema Sutra in the group’s newly opened, sister property in Colombo. A self-taught chef - something he is very proud of – Munidasa has managed to place two of his restaurants amongst the best 50 in Asia. Born in Tokyo to a Japanese mother and a Sri Lankan father, he fell in love with food watching his parents cook. 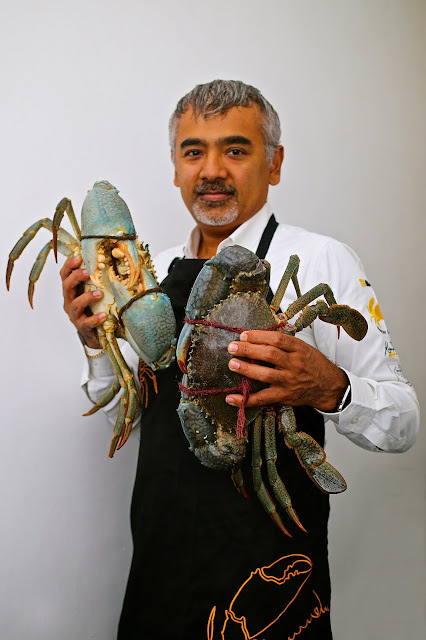 He embraces the traditions of Sri Lankan cuisine and gives them Japanese sensitivity and elegance, he explains. He is mindful of the ingredients used in his kitchens – sustainability plays a central role in his dishes. One of his restaurants, Ministry of Crab, one of the most coveted (and dear) tables in Colombo, uses 100% locally sourced ingredients. What We Ate: After champagne, chilled, whole King coconuts were brought to our table - a great, and delightful surprise. Native to Sri Lanka, King coconuts are bright yellow in colour and have plenty of refreshing water. We kicked off with Spicy Ali Geta Pera salad, a tapas-style avocado filled with a preparation of Seeni-sambol (a sweet and lightly sour relish made with dried bonito flakes and seaweed). This was great - creamy, tangy, spicy, and bursting with umami. Then came the beautiful Egg Hopper a la minute, “a bowl-shaped rice flour crepe that is crusty on the edge and soft in the middle”, a popular Sri Lankan breakfast or tea-time dish. The curries were brought at the same time, along with a Rustic coconut roti. “The way to eat a Hopper is using your hands”, advised the nice gentleman sitting opposite me, who I later found out was Sri Lanka’s Deputy High Commissioner. I couldn’t have asked for a better person to teach me Sri Lankan dinner table etiquette - he also suggested I added the beautiful fresh water prawn curry, with its rich and creamy gravy, to the eggs. It was the first curry I tried that evening. The prawn was meaty and juicy; the gravy had a hint of kaffir lime that brought a refreshing yet peppery flavour to the dish. I was very lucky to be seated with guests who were too polite to go for a second helping. I took my chance in a flash. The prawns were too good to be left in the plate. Next up were the dry chicken curry, made from diced, skinless dark meat and the tuna Ambulthiyal, a sashimi-grade tuna from the Indian Ocean cut into cubes and cooked a la minute with a tangy garcinia (a tropical fruit that can be used like tamarind). We wanted to love both dishes, but in our opinion they were a tad dry and lacked some needed flavour oomph. Better though was the Crab Kottu, a traditional Sri Lankan dish considered by many to be the ultimate comfort food of the land. This was a delicious stir-fry of crabmeat, shredded roti, vegetables, chillies and curry leaves that got me scraping my plate. Kaema Sutra’s signature dessert – What the Hopper – is Munidasa’s sweet take on the savoury version. Described as a crunchy Pani Appa, it was a crepe filled with whipped curd, topped with fresh strawberries and drizzled with pure palm treacle. This was light as a feather and well balanced (not too sweet). As someone who likes to travel and experience different cuisines in their original setting, I imagine all these dishes would have that tropical je ne sais quoi if I were sitting on one of Sri Lanka’s paradise beaches, or at the Shangri-La Colombo. The crafted dishes of Chef Dharshan Munidasa, however, gave me a taster of Sri Lankan flavours, of sunnier days and warmer climates, they made me want to pack my bags and head to this fascinating island. If you are planning to visit Sri Lanka, the newly opened Shangri-La Colombo is the top luxury hotel in the country. Kaema Sutra Restaurant, serves fine dining Sri Lankan cuisine and is on the fourth floor of the hotel – to find out more about Shangri-La Colombo and Kaema Sutra restaurant, visit their website here.